Supervalu Inc. is shedding more of its retail stores. The Eden Prairie-based company announced Tuesday that entered into an agreement to sell 19 of 36 Shop 'n Save stores to St. Louis-based Schnuck Markets. The deal is expected to close in October. Most of the stores, some of which include pharmacies and fuel centers, are in the St. Louis, Mo. area with several more in Illinois. Supervalu announced plans to sell Shop 'n Save in April before the company's much bigger news in July that it is being acquired by United Natural Foods Inc. in a $2.9 billion deal. Besides Shop 'n Save, Supervalu also owns 78 Cub stores, 52 Shoppers stores in the Washington-Baltimore area and 8 Hornbacher's in the Fargo-Moorhead market. When the purchase of Supervalu was announced, United Natural Foods' CEO Steven Spinner said that the retail stores would be sold "in a thoughtful and economically driven manner." So far, no further information has been released about the sale of any Cub stores. In July Hy-Vee announced that it purchased one Cub store in Plymouth on County Road 24, but in an interview with Hy-Vee's CEO Randy Edeker last week, he said that Supervalu had not contacted the Des Moines-based grocer about taking over any Cub stores. A complete list of Shop 'n Save stores, pharmacies and fuel centers being sold can be found here. Schnuck Markets operates about 100 stores, mostly in the St. Louis area with others in Illinois, Indiana, Iowa, and Wisconsin. 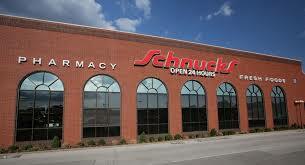 Founded in 1939, the company is still owned and run by the Schnuck family.